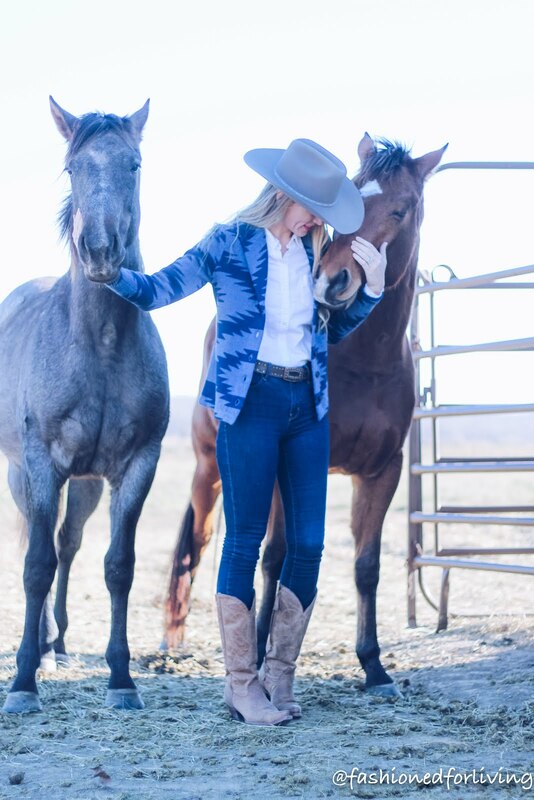 All the western vibes in this outfit post. 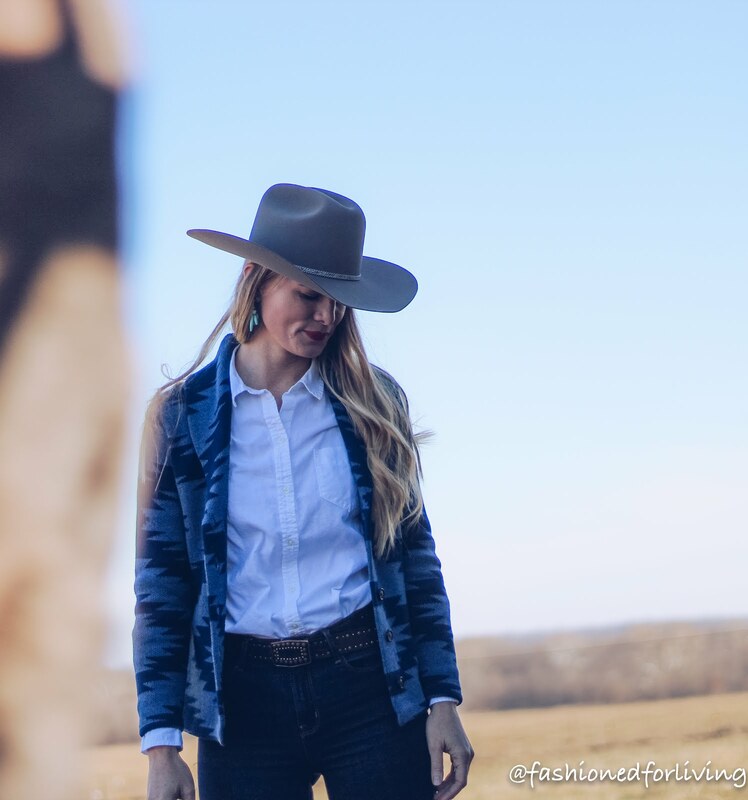 My personal style leans towards classic pieces, usually minimal accessories, and my western, cowgirl style is no different. 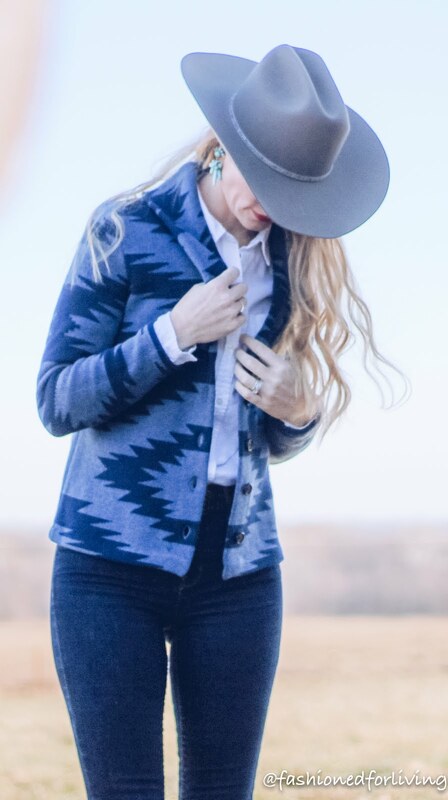 This blue aztec/geo print cardi coat gives a nod to traditional country dress, but remains true to me with its understated tonal blue pattern. I paired a white button up under it adds a bit of sophistication and chicness. The felt hat is a recent, much needed purchase. 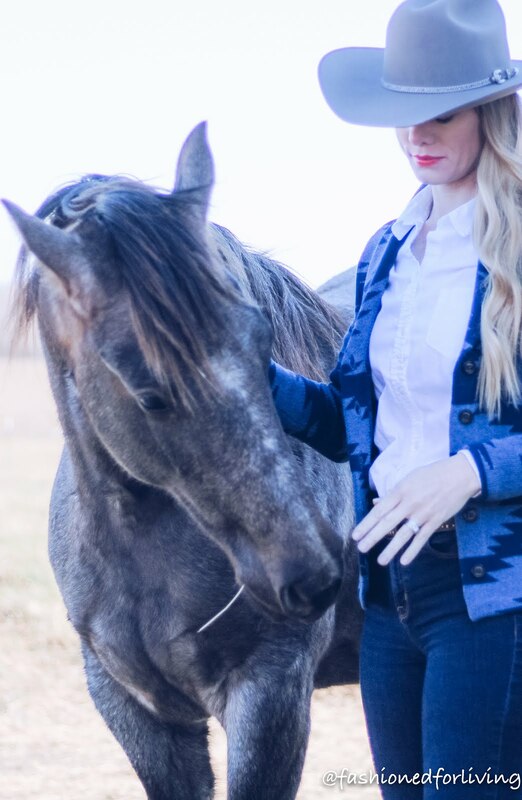 I plan to show Scotch and Scarlet this summer, and fell in love with the taupey/grey color that will coordinate well with many different show outfits. 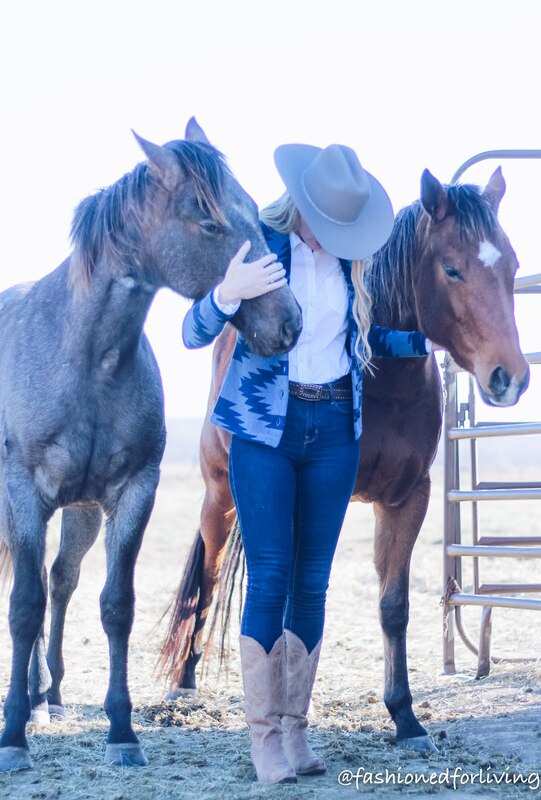 Dark wash, high rise skinny jeans are a wardrobe staple that will go with everything and make you look stylish and skinny!! Winning! Looking at my beauty and to the future... So excited to see where this year takes us both!! 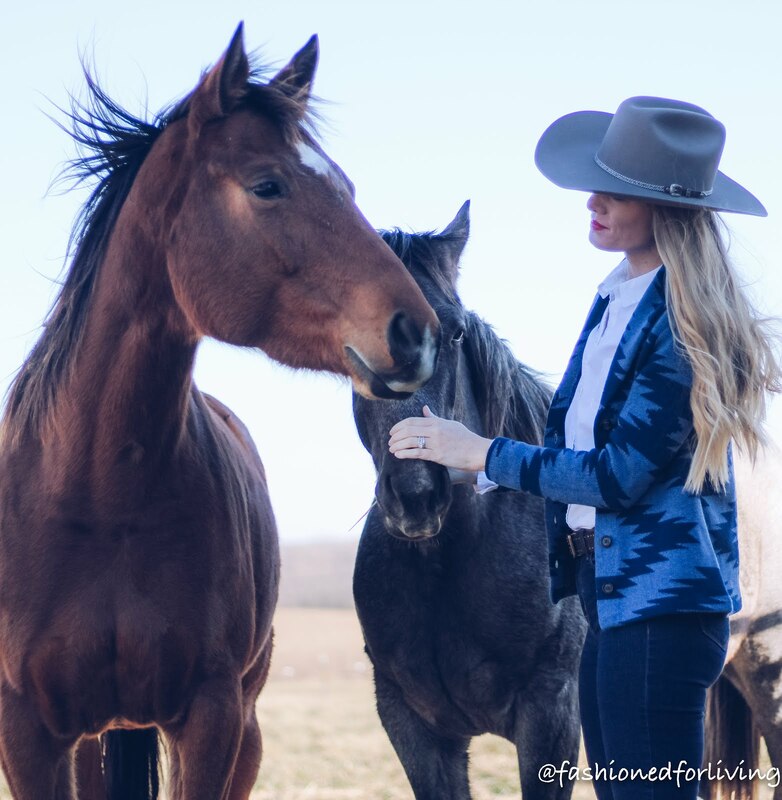 I have been slacking the last couple weeks over Christmas break with all things Fashioned for Living as far as posting and such, BUT I have been in deep thought (the wheels were grinding;-)) about how I want to continue on. I started blogging two years ago December...time really does fly! 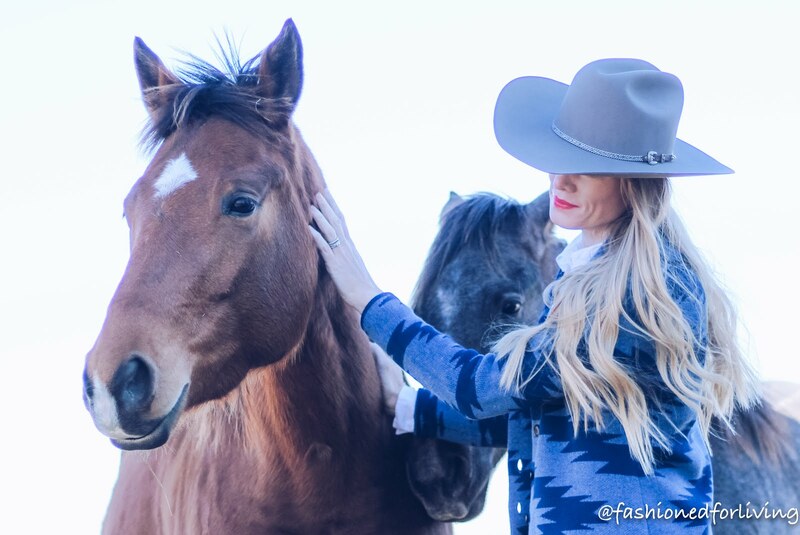 I have been trying to figure out where I fit in with my brand of western fashion while still incorporating my real life everyday style, how to mix more of "me" on a personal level, AND how to include all things horses. 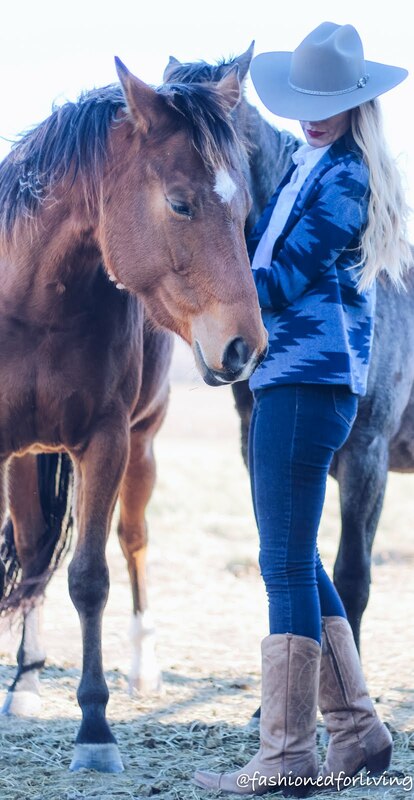 My big life goal for 2018 is to show horses again. I haven't shown in a really, really long time...so long I can't really remember the last show I was entered in. Probably because it was just another show at the time, and taking a break from the show ring wasn't a conscious decision. It just happened with the demands of school, sports, and working. You are a witness to dreams coming true for me, dreams that have been on hold for decades. We purchased Scarlet (the grey) a coming two year old and Scotch (bay pictured above) a green almost four year old last summer. 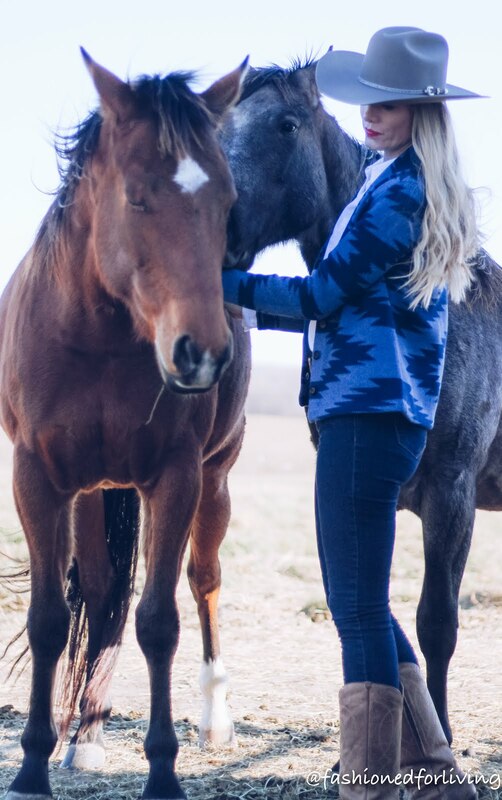 Both mares are the fanciest horses on paper (for lack of a better way to put it) that I have ever owned. 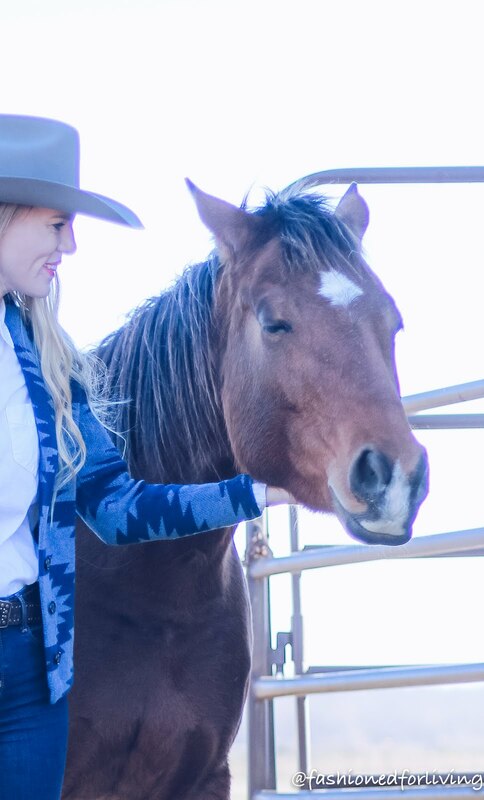 I find great joy in working with green horses and teaching them all my bad habits, and not trying to overcome someones else's. I say this in gist, but there's a bit of truth to it AND green horses are in my price range! We plan to start small at some local fun shows, get back in the swing of things, and hopefully advance from there. Though I have a tiny bit of knowledge and experience, I AM NOT A EXPERT!! I have so much to learn and I am really excited to take y'all along for that journey! SO, I am not exactly sure how this going to manifest on my blog, Instagram, and YouTube but I am just going to try things and see what works best for everyone. What kind of content would you like to see in the new year? hat - Resistol - Style "Trail Dust" - Color "A9 Desert Tan"